Are you looking for the best K2 cooler available now? K2 Coolers are one of the toughest and the most powerful coolers out there that has the capability to keep ice for days. It is priced reasonably, aside from the fact that it is also a high-performance cooler. Indeed, its value really shows when you compare K2 coolers to its competitors on the market now. In this post, we will go in detail onto the K2 Summit series to see if it offers better performance than other similar options. In addition, we will be discussing each cooler’s best features, pros, and cons to help you make the right buying decision. Hopefully, you get to at least narrow down your choices into choosing only the best K2 cooler for your money. 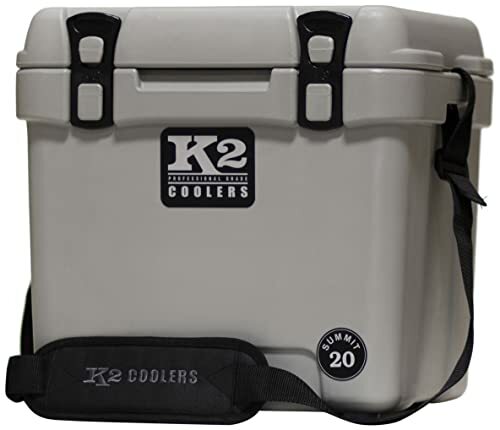 The K2 Coolers Summit 20 is a member of the Summit family of coolers. This cooler is a premium roto-molded ice cooler that is specifically built for outstanding durability. It features superior dense insulation, long-term ice retention, and a neoprene seal. This would be perfect if you are planning a tailgate party, camping, or any other outdoor adventure. The Summit 20 features a unique cube shape, which effectively helps in minimizing the amount of space it takes at the back of your truck. To add, the lid comes with roto-molded hinges with sturdy latches that keeps all your goods frozen and fresh. Indeed, the manufacturer goes into so much detail to make sure that you only get the best cooler for your outdoor adventure needs. The K2 Summit 20 cooler offers a seamless roto-molding design process, which would mean that ice retention is deemed superior compared to other options today. It is made with food-grade plastic, which also has the capability to handle dry ice. What we like about this cooler is that it is UV-resistant, being able to stand up to, as well as divert the heat coming from the sun. This K2 Summit 20 cooler also comes with superior insulation, injected into the cooler’s body using high pressure. This feature provides you with the benefits this cooler is made popular for. Plus, it comes equipped with a unique gasket built into the lid, which keeps the heat out and the cold in. Surely, this feature helps with the cooler’s insulation process. The K2 Summit 50 is another great product in the Summit series offered by K2 Coolers. This cooler can hold up to 40 cans and it only weighs around 26 lbs. Obviously, the bigger the K2 cooler gets, the more goods will fit inside it, perfect for larger outdoor weekend plans. If you like to go on a weekend trip with your family or a small group of friends, then this cooler would do the job. The K2 Summit 50 cooler, of course, also has the brand’s trademark features. It is equipped with the incredible insulation system that can hold your ice for days, even during summer. It also is made of durable materials, keeping your cooler unharmed through rough weather conditions. It comes with the steady rubber fit, the sealed lid latches, the hinge system, which all works for excellent, easy, and quick drainage. This K2 Summit 50 cooler is loaded with awesome features, such as the lid latches. These are strategically designed to create a positive seal, mounted on the molded-in keepers that provide the perfect closure every time you take something out of the cooler. In addition, it has a hinge system that is specifically designed to keep the lid attached permanently. Another reason to consider the K2 Summit 50 cooler is that it comes with the non-marking rubber feet, which effectively keeps your cooler exactly where you left it. This cooler also comes with a drain plug that allows easy and quick drainage using just a partial turn. This way, there would be no need to remove the plug fully. Lastly, it features a gasket made of silicone for a water-tight seal. The K2 Summit 30 is another great product in the Summit series by K2 coolers. You will never be disappointed if you bring this cooler along in your camping, fishing, hunting, boating, tailgating, and rafting activities. You can also use this very efficient cooler even if you just want to enjoy a day at the beach or a backyard barbecue party. 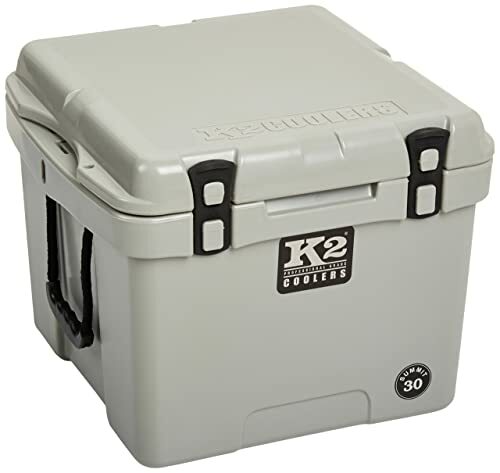 This K2 Summit 30 cooler features a one-piece roto-molded construction that exhibits outstanding durability and toughness. It is constructed with food-grade materials, both UV-resistant and compatible with dry ice. It also comes with an amazing insulation system, which is injected under high and extreme pressure, making sure that you get the appropriate insulation for ice retention. Another great feature of the K2 Summit 30 is its gasket, designed and installed to lock the cold in while keeping the heat out. It is also partnered with the Lock Away lid system that will keep the goods ice cold or steaming hot. These useful features all work together to keep your items protected from all the harmful external elements. Just like the previous K2 Summit models, the Summit 30 features lid latches, designed to create a seal for the perfect closure. In addition, it has a hinge system that keeps the lid permanently attached. This cooler comes with rubber feet that restricts the cooler from making unnecessary movements in your vehicle. Another great feature of the Summit 30 is that its drain plug, designed for easy and quick drainage. You also have the option to remove the entire assembly just to make the draining a lot faster. This cooler is also equipped with rope handles that makes heavy lifting more convenient for you. This K2 Summit 30 cooler has dual anchoring points you will find on both sides, which you can use for an easier and more convenient mounting. Lastly, it comes with integrated padlock holes so you can secure the contents of your cooler. K2 Coolers totally lives up to its reputation on being one of the best manufacturers of coolers around the world. With their Summit series, you can freely choose which one to buy, may it be the Summit 20, Summit 30, or Summit 50. These products exhibit great performance, and you only need to choose which size fits your needs and preferences. Hopefully, we have done our part in making the decision making a lot easier for you when choosing which K2 Summit cooler to buy.